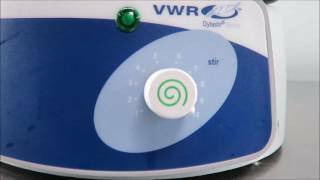 The VWR Dylastir Magnetic Stirrer is a powerful little stirrer that’s ideal for everyday mixing needs. This lab stirrer has a speed range of between 100 and 1600 rpm and can handle volumes up to 1500 ml. The aluminum top plate of this lab stirrer has a 6.5 inch diameter and can accommodate most standard flasks. The 10 level, variable speed control of this magnetic stirrer provides you with accurate and reproducible results, time after time. This VWR Dylastir Stirrer 12620-974 has benn thoroughly inspected and ran as expected. All of our lab equipment comes backed with our standard warranty. Should you have any questions, please don't hesitate to contact us.